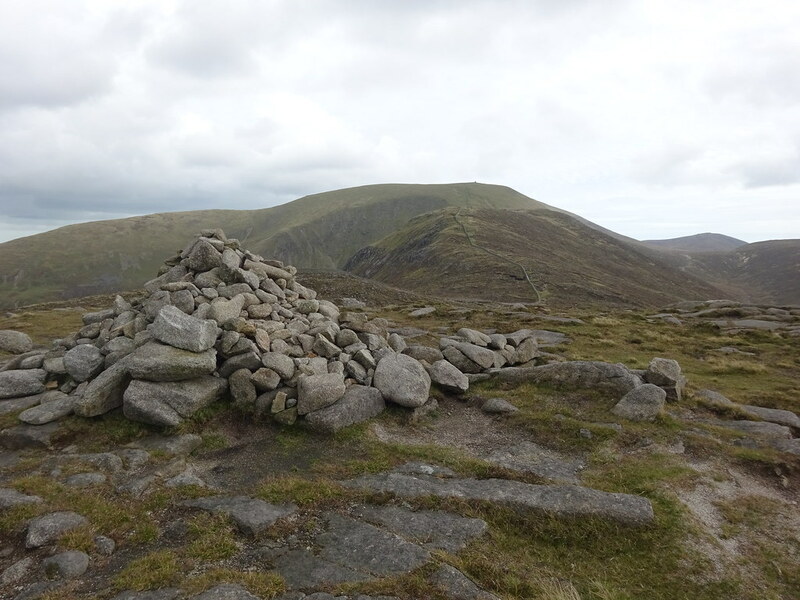 A few weeks ago I paid an overdue return visit to the Mournes, with the aim of conquering Slieve Donard, the county high point of Down, the high point of both Ulster and of Northern Ireland, and a fantastic peak in its own right. Having previously climbed Slieve Donard from both the popular Newcastle and Bloody Bridge approaches, this time I started at the Trassey car park and my route included the Trassey Track, Slievenaglogh, Slieve Corragh and Slieve Commedagh before scaling Slieve Donard and then returning via the Brandy Pad and Hare’s Gap. Conditions were ideal with the sun peering through the clouds as I proceeded up the Trassey Track towards the mountains proper. 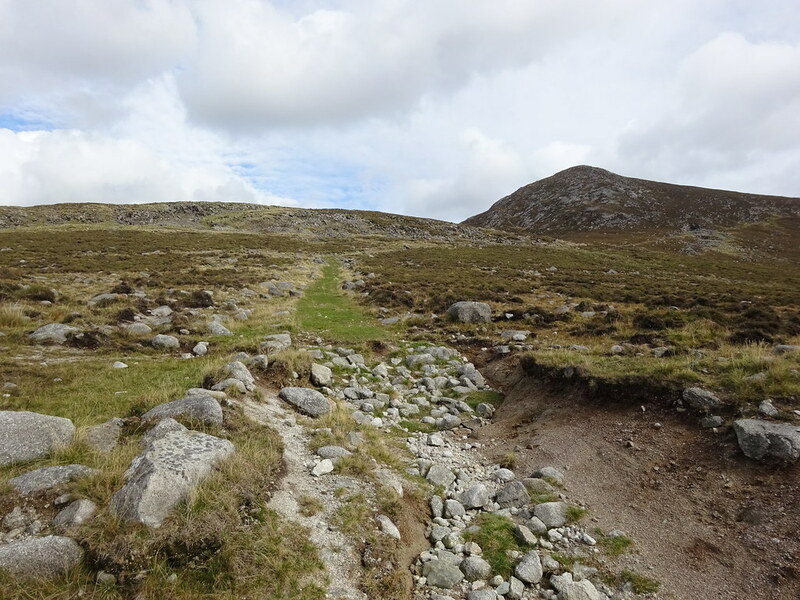 Rather than continue straight towards Hare’s Gap, I took a left turn off the main track to ascend the western side of Slievenaglogh, up a pleasant and alternately grassy and stony track that I had successfully tried out on a previous hike. Oddly enough, isn’t marked on my map (OSNI Mournes Activity Map 1:25 000). Proceeding gradually up this track, I climbed above Hare’s Gap to my right to meet and cross a stile over the Mourne Wall near the Diamond Rocks viewpoint overlooking the Ben Crom reservoir. From there I proceeded westwards along the Mourne Wall to reach the adjoining summits of Slievenaglogh and Slieve Corragh. From Slieve Corragh, the route first entailed a descent and then a steep ascent up the eastern flank of Slieve Commedagh. 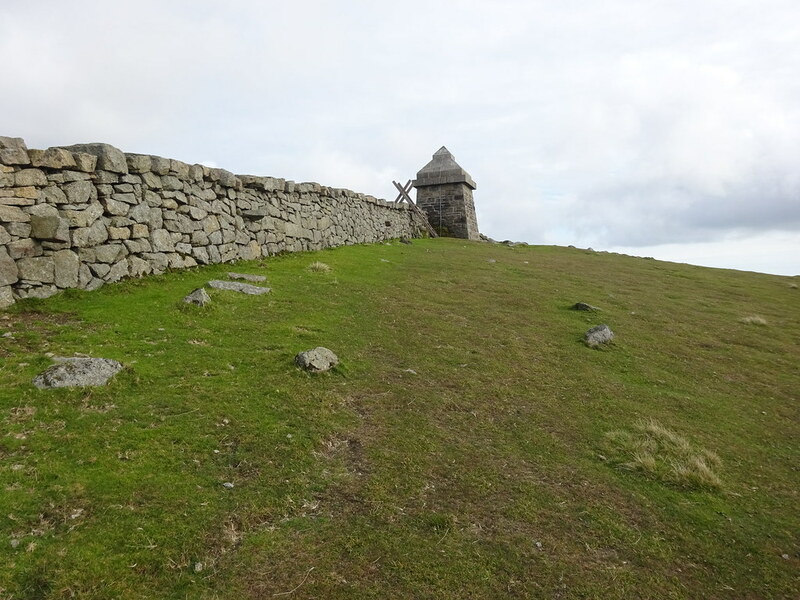 The photogenic stone hut built into the Mourne Wall near Commedagh’s summit was eventually a very welcome sight. 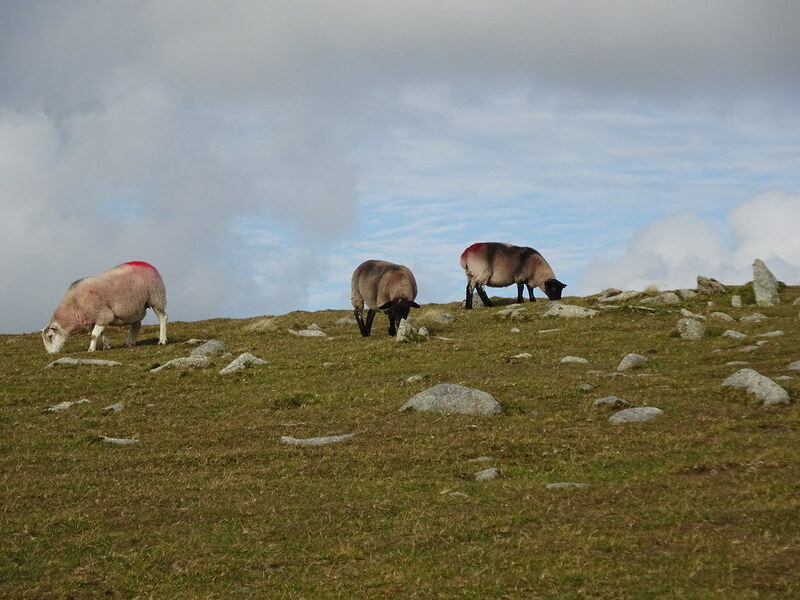 I crossed the adjacent stile and made for the nearby summit cairn, with the grazing sheep paying me no heed whatsoever as I passed. 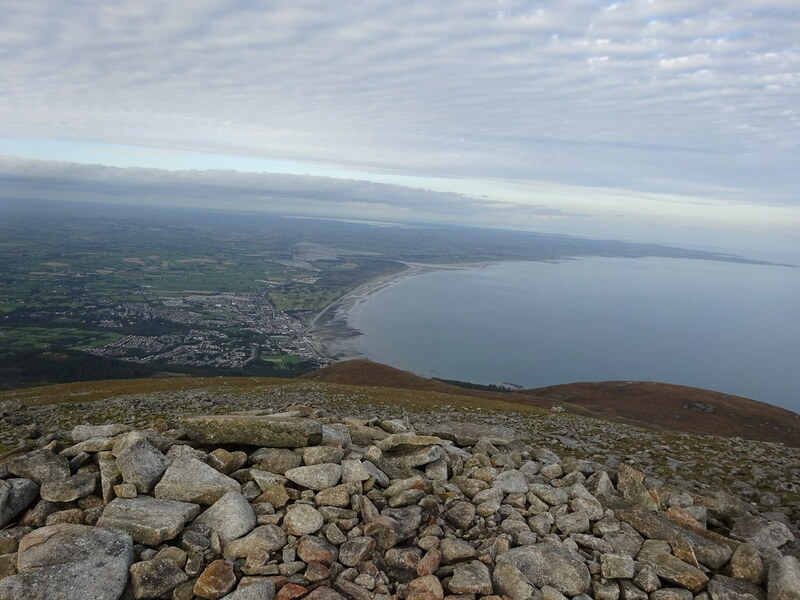 Commedagh’s summit is as scenic as they come on a good day and I lingered a while to enjoy the vistas of the Irish Sea and Slieve Donard to my east. 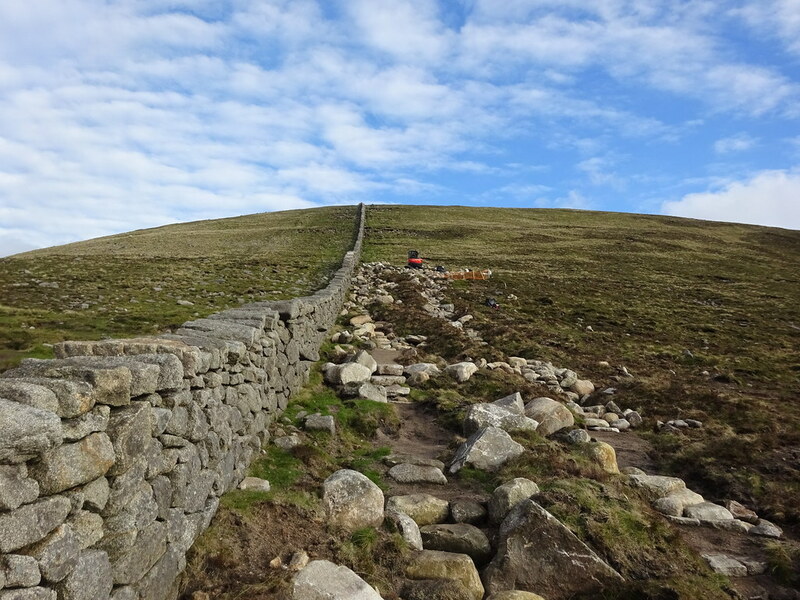 From there it was back to the Mourne Wall and a descent to a col before the ascent of Slieve Donard itself. I was both intrigued and pleased to see machinery on the southern side of the Wall where it appears a new track is being laid. 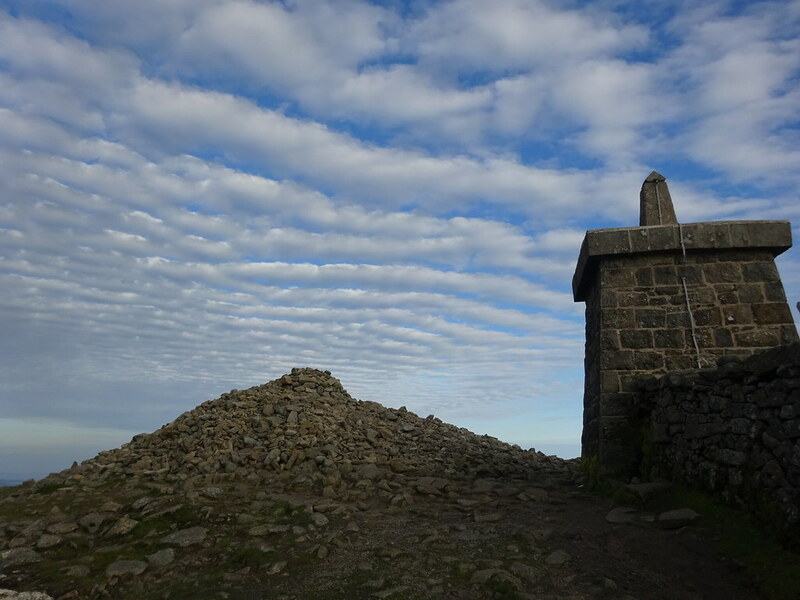 Further on, the climb up Donard seemed to get steeper and steeper but it was no time before I reached its summit, where the unusual cloud waves overhead made for a very pleasing view of the elevated trig pillar and cairn. 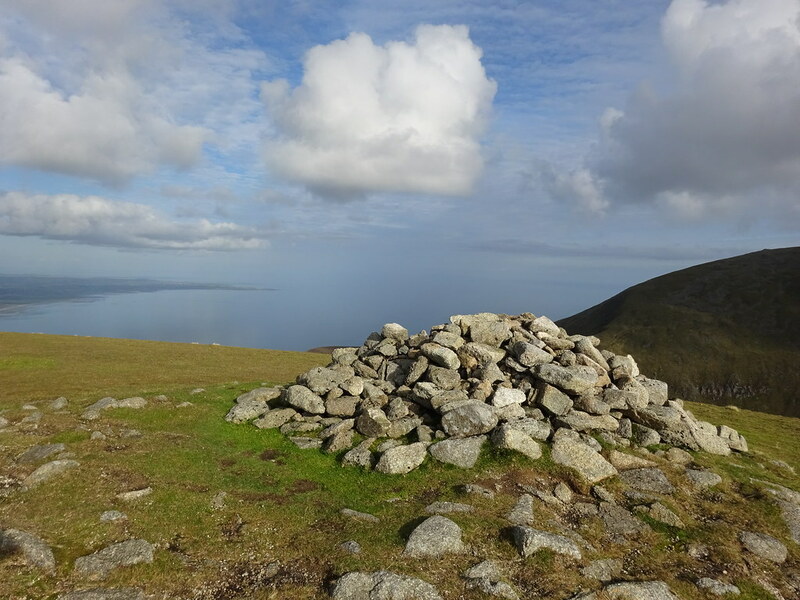 Before leaving the summit I diverted approx 200 metres north towards another, lower cairn which gives great views of Dundrum Bay, the town of Newcastle, and Thomas and Millstone mountains. It was soon time to descend Slieve Donard the way I had ascended and upon returning to the col with Slieve Commedagh I this time diverted to my left to join the Brandy Pad, the long, snaking “low road” that connects the western extremity of the Mournes at Bloody Bridge with the Trassey Track to their east. 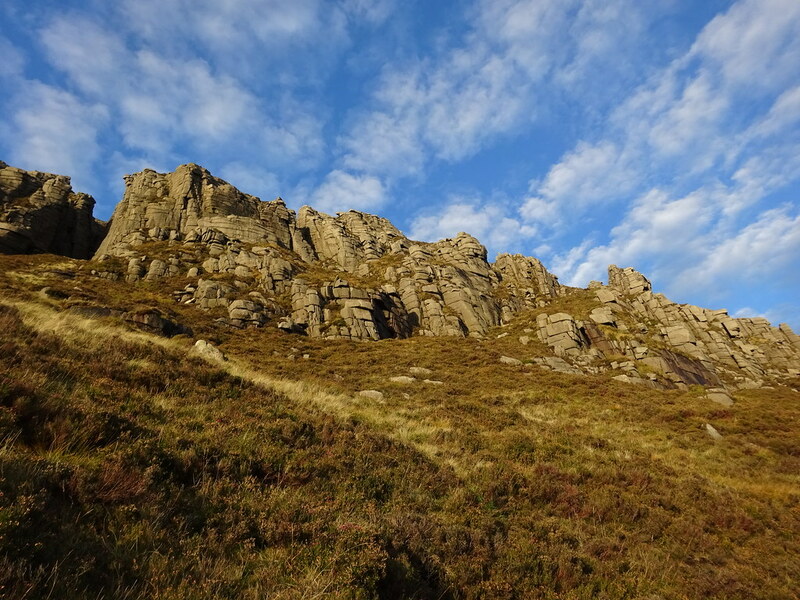 The evening sun provided wonderful views of the irregular rock formations known as the Castles overlooking the Brandy Pad below Slieve Commedagh. The autumn light was beginning to fade as I eventually reached Hare’s Gap and proceeded downhill to meet the Trassey Track, and back to my car. The walk took some 5½, hours and was most enjoyable. Next Post4 Highpointeers, 6 High Points, 1 Day!